Written by Rick Wise and posted on February 13, 2016 . On Georgian Bay and the North Channel, much of where we camp consists of rocky ground and regular tent pegs are basically useless. Exposure to high winds on open ground makes it essential to anchor your tent securely. I’ve seen more than a few improperly anchored tents blown away by high winds and even moderate winds, even though the owners had all their belongings inside the tent as well. Here is a way to make sure your tent or tarp is properly secured that is easy and keeps your equipment in good shape. Find a stout stick, at least 12 to 24 inches long. Place it through the tent peg loop and lay it on the ground so that the loop sits in the middle of the stick. Next find two suitable rocks, large enough to pick up with two hands, but safe to carry, and place them on the stick at each end. Make sure the stick is on the side of the rock furthest from the tent. Here’s a photo of what it should look like. 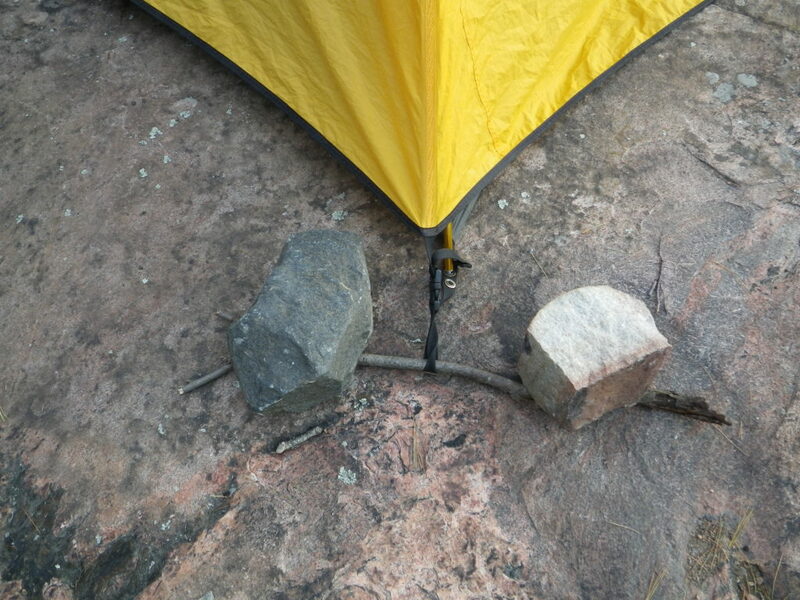 It’s important to make sure that the fabric of the tent or the tent loop is not underneath the rock. Nor should you ever place a rock or heavy object directly on or inside the tent. High winds cause the fabric to vibrate or scrape on the surface and this will wear a hole right through the fabric in short order. If anchored properly, the tent will not be damaged and it will remain secure even in heavy winds. I’ve included video of a tent in high winds and pictures of what the anchors look like. I must admit that the rocks in these pictures are a little small. My general rule of thumb is, if you can pick it up in one hand, it’s too small. Go with as big a rock as you can safely carry or use several rocks per side. Make sure they are balanced and holding the correct direction of pull.